CardRunners EV is advanced poker analysis software that will allow you to take your own private research to a whole new level. The software even contains a GTO solver with one of the fastest algorithms commercially available. Using CardRunnersEV's hover-and-click based interface you will be able to build decision trees and calculate the EV of every decision within that tree. Using its revolutionary popup system you can zoom in on the data for any individual hand, anywhere in your tree. 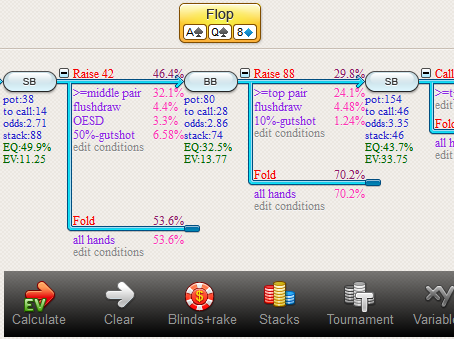 CardRunnersEV's GTO solver works both preflop and postflop, and even for tournament hands and hands with rake. 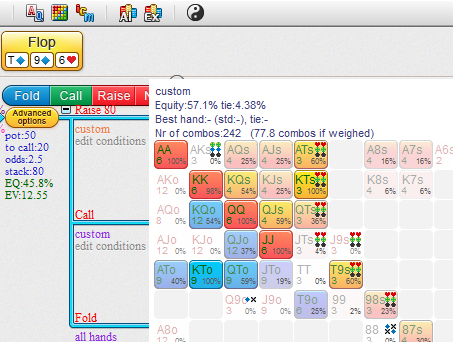 Analysis is a simple matter of building a tree with the tree building wizard, entering any play you see fit and letting the solver figure out the rest. The algorithm is one of the fastest commercially available. 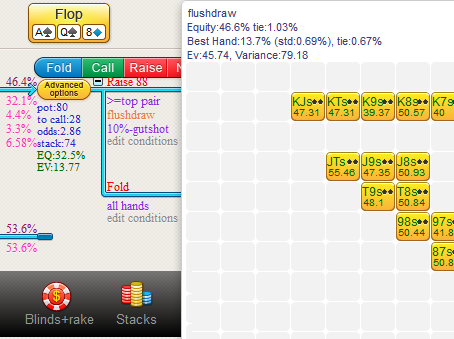 It converges within minutes for flop hands and within seconds for preflop, turn and river play. To bring up more data on any number or item in your tree, all you need to do is mouse over it. Popups with more information will automatically appear. This feature will allow you to zoom in on the EV performance of individual elements. Even all the way down to the level of individual starting hands. The software also features a system of dynamic popups. 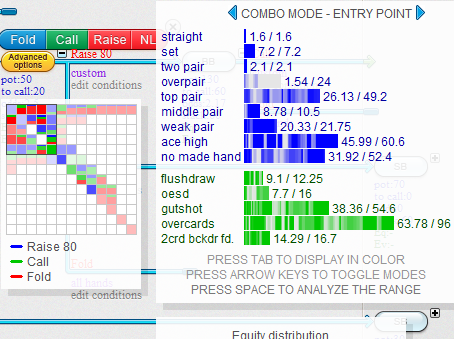 Just mouse over any item in a tree and it will show you more information on that item, such as hand strengths, combos and equity distributions. The system is extremely fast and does not even require for the user to do as much as push a button! Just mousing over an item is all you need to do. For a demonstration, please watch video 2 here. 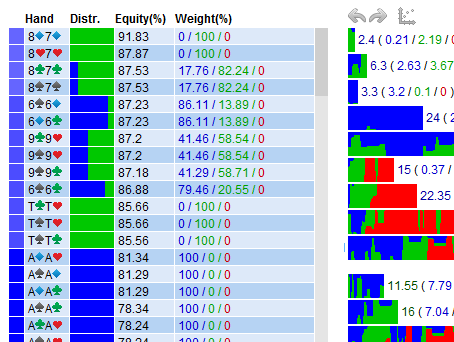 Finally, the software features an easy to use analysis tool that will allow you to zoom in on EV, equity, combo and weight data for any individual hand in a range. To bring up the tool, all you need to do is mouse over any item in the tree that you are interested in, and press SPACE on your keyboard.